A set of 4 Designer Posters'. At the workplace, punctuality is considered to be one of the most critical quality for success. Success definitely belongs to those who choose to finish their work ahead of time. Use this designer poster SUCCESS to motivate and remind your employees to always try to complete their task before the scheduled time﻿. A set of 19 designer posters. Your workplace canteen is a place where employees meet & interact with each other. You want them to enjoy eating their food as it will have a positive impact on their personal interactions. Improved relations help improve organizational performance. Lord Ganesha (also known as Ganapati) is widely revered as the Remover of Obstacles and more generally as the Lord of Beginnings. Use this designer poster GANESHA - START THE DAY RIGHT to honor Lord Ganesha at your workplace. Om or Aum is of paramount importance in Hinduism. It is a sacred syllable representing Brahman, the impersonal Absolute of Hinduism &mdash; omnipotent, omnipresent, and the source of all manifest existence. Although Om symbolizes the most profound concepts of Hindu belief, it is in use daily. The Hindus begin their day or any work or a journey by uttering Om. Use this designer poster OM - THE SYMBOL OF INTRINSIC PEACE to help spread the message of spiritualism and peace at your workplace﻿﻿. Educate your employees about the vices like drinking, smoking, drugs & tobacco. These designer charts explains the ill-effects of various substance abuses. Employees should be motivated not to indulge in these bad habit and to refrain from smoking,drinking, drugs & tobacco. SMOKING CAN KILL YOU to educate your employees on how cigarettes damage health, on what diseases are caused by smoking and on how to quit smoking. A set of 5 Designer Posters. Poster on Zero Tolerance Policy towards Sexual Harassment at workplace. Poster is a part of SA 8000 STANDARD. Celebrate International Yoga Day - June 21,2018!! The time Action is NOW! 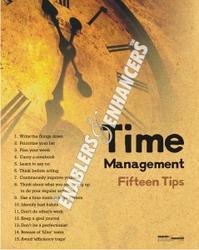 We at E&E have developed beautiful designer posters on ‘Time Management’. Inspire your people at workplace to use their time correctly. This will make all the difference.